I'm always wary of a press release that says something like, "Whether or not you describe it as Progressive Electronic or Progressive Electronica, Ambient, or New Age Music..." It often means that it is indeed New Age, but the artist (or label) is putting on a few rock pretensions to try to reel in some old progressive fans as well. Well, this is not the case for keyboardist Russ Mate's solo project, Just Offshore. It's got a touch of darkness and a certain edginess to it that distances it from the New Age label. It's too complex and draws your attention too much to be considered "ambient". It's not beat driven dance music, so in my mind, that excludes the "electronica" label. So I'll go with Progressive Electronic. Indeed, Russ Mate comes from a definite rock background, so this makes sense. 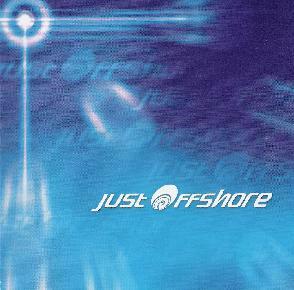 The music of Just Offshore is certainly reminiscent of Tangerine Dream, though the relative shortness of the pieces and the structured nature of the composition strike me as being closer to early 80's TD, right at the beginning of their transition to digital technology. Think albums like White Eagle or Hyperborea. But Russ Mate also tends towards a bit more of a symphonic approach, hinting at influences such as Vangelis. The album opens with its strongest track, the swirling and intense Ocean Storm. Mate shows off his keyboard chops with some dazzling melodies weaving through the menacing sequences and symphonic washes of synth. The Possibility Exists, though the shortest track on the album at just a touch over three minutes, is the most progressive oriented piece on the album. Drawing from classical influences, it had a bit of a Rick Wakemanesque feel to it. Meditation Medication is probably the piece on the album that most closely follows an early 80's Tangerine Dream approach, whereas Endless Journey strays towards more Vangelis style electronic symphony. Galactic Contruction was another of my favorites on the album, not only for its cool title, but for the quirky, multi-layered rhythms and dark waves of spacey electronics. From Here to There is a fairly straightforward, but nonetheless effective composition, and 24/7 ends things off with its bouncy, even slightly cheesy (in a good way!) rhythm contrasted nicely by glorious dark swooping synths and mysterious atmospherics. The only misstep that Mate takes, in my mind, is his somewhat dubious choice to do an instrumental cover version of the song made famous by The Animals back in the 60's, House of the Rising Sun. I don't think this kind of electronic music lends itself very well to cover versions (though Tangerine Dream themselves did a cover of Hendrix's Purple Haze on their 220 Volt Live album - but even that was full of wailing guitars, and it was a live performance, not a studio recording). But while there is nothing intrinsically wrong with Mate's electronic interpretation of House of the Rising Sun, the problem I had with it is that its far too familiar chord progression and melody took me out of the mysterious and exploratory mood of the album. But barring that one lapse in judgment, there's still lots of excellent, original electronic music here to check out. For more information you can visit the Just Offshore web site at: http://www.justoff.com. Visit the Power Voltage Records web site at: http://www.powervoltagerecords.com. Contact via snail mail c/o Power Voltage Records; PO Box 430302; Miami, FL 33243.